Hilting! This where my years of reading about, dreaming about, and drawing swords started to come to the slightest amount of use. I've always been drawn to subtle, sweeping lines and curves in swords. The more practical, understated beauty of earlier medieval swords has always pulled at my fancy. 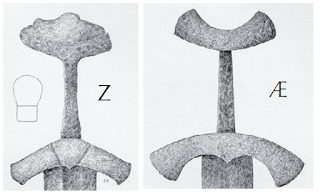 While I am deeply invested in the magical and alchemical processes of pattern-welding that were the hallmark of the semi-mythical legendary Age of Heroes, the Germanic Migration Period, I am also fascinated by the aesthetic of the later sword: monosteel, more mass-produced, less an object of adornment and symbol of wealth, but somehow more stripped down; in many ways more true. It speaks of machines, of industry and war in a more direct and somehow equally beautiful way. I wanted my first sword to be like this. I write of a weapon that is supposed to look like it has been and can be used. It is not a king's scepter; it is not a peasant's billhook. It is a weapon and a tool of war whose aesthetic is meant to reflect nothing other than what it is. It has grace, it has refinement, but only insofar as what does not inhibit it for what it is. The guard was forged of the same 1080 steel that the blade was. There's no real reason for this; I honestly would prefer that I had made it out of a softer steel, so I could have engraved it or otherwise adorned it. But I think that being trapped in hard, simple steel was good for providing me with creative boundaries to work with. One great thing about forging this guard with Owen was that I was able to bear witness to his 17 years of blacksmithing experience, and not just his bladesmithing skill. Blacksmithing is something that I honestly admire more than bladesmithing, though being a bladesmith is my current aspiration. In comparison, a bladesmith's forging skill set is rather small and the dimensions in which he or she is required to think are very narrow. The ability of a blacksmith to understand the material and its flow, the boundless opportunistic advantage-taking of angles and weight and heat, dealing with the vicissitudes of the material and tools: all these are a source of endless fascination and admiration for me. Owen was able to think about the stock in a way that let him map out, over several stages, the exact shape I wanted to create. This understanding is something you can only build with common sense and sheer hours of doing. Jim Austin, too, is a person I have spent considerable time with, simply mesmerized by his deep knowing of his tools, materials, and limits. A bladesmith and notable presence in today's movement is the young and very seriously talented Josh Burrell, a good friend of mine. Josh is the son of a blacksmith and a jeweler, and has an organic and spiritual understanding of craft that results from a lifelong surrounding by it and its love, and yet also requires a particular and special personality and intelligence. Having both, his work is truly impressive, executed with skill, and filled with obvious love. There is a word I read once: bone-knowing. This word describes to me what comes with skill and patience and mistakes and despair and resurgence and hope and inspiration and hard work of learning a craft. One of the reasons we learn craft is to feel this bone-knowing: to have a flow and harmony to our movements with our surroundings and our materials. There is a song to work, sung by our bodies, our tools, our materials, and our souls. We become a part of our workspace, our tools become extensions of our bodies, and we connect ourselves to our materials through the tools. Our materials are of the earth, and when we join the song of craft with our bodies, our souls join with our work. Here is the guard as I work on the geometry under Owen's direction. I wasn't referencing a particular guard, but rather imagining one in harmony with my blade. My design comes from an archetypical understanding I have that comes from years and years of poring over pictures of swords, drawing swords, and voraciously internalizing and processing them. I have so, so much more to learn, especially about how to look at swords and think about their components and proportions, but I have a sense of them, regardless of how true they are. What's interesting about this particular shape is that it's both common and beautiful. Countless variations of it are extant on originals, and this means one thing: it's intuitive. It's easy. It's easily prepared for, and someone with a bit of a blacksmith's mind knows just how to tease the iron into that shape. 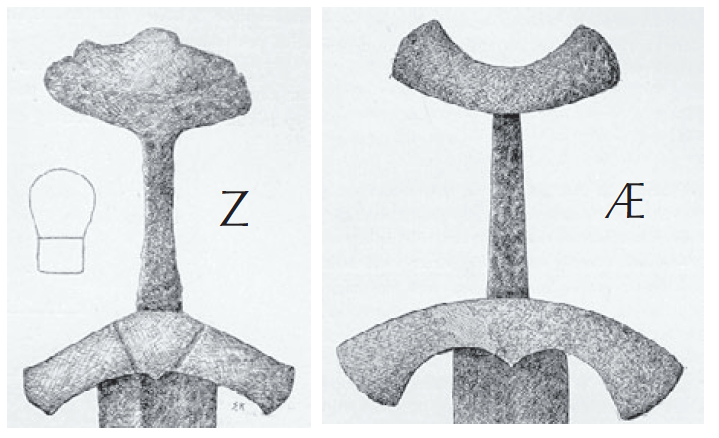 The earliest guards forged out of a single piece of iron are on viking swords, and take either the most simple cross shapes, slight curves, or else some early evolution of this shape (Peterson Types Z and Æ). The pommel's work was full of imagining radii and asymptotic curves. There was quite a bit of heavy grinding with the belt grinder on both, using a flat platen behind the belt for the outside curves and a contact wheel (generally 1") on all of the interior radii. The pommel was tricky and hard to hold onto during that part! The fitting of the guard's opening from that point was refined with a dremel tool and little files. That took quite a while, but I got it to a tightness with no wiggle or rattle, and it held itself on tightly by friction alone. I was very happy with it! 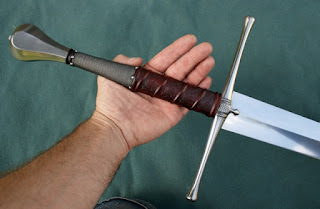 You find yourself spending less and less time actually working on your sword as it nears completion, and with each new step in wieldability, you really just play with it more and more, making excuses to walk across the shop for a different tool and slaying invisible enemies as you traverse the concrete.